This view of the frit house shows that the large privet hedge is getting a wee bit shaggy to say the least. 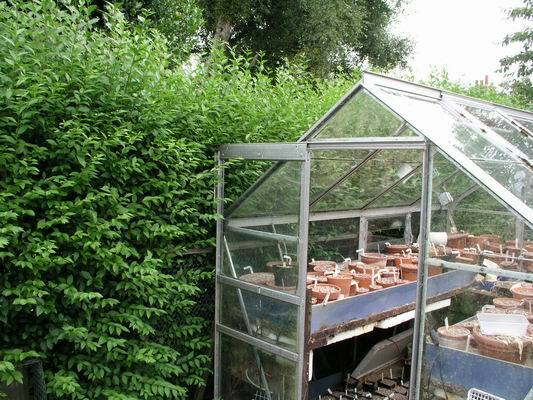 It is not only a great boundary between the neighbours, providing privacy, but it offers essential cover and a home to birds and other wild life. We cut it once a year in late July or early August, long after the nesting season is over. While I say cut, it is more that we crop it - you can see how much we remove - cutting it hard back so that it does not get any larger. Our local Authority has just given us a 'brown wheely bin' for garden waste which they will collect and compost the contents in a municipal site - this is a great step forward as before all that material went to landfill sites. We will find a use for this bin but we never put anything out from the garden - it is all composted and recycled. In fact we were years ahead of the Council in collecting suitable material (hedge trimmings, prunings, fallen leaves, etc,) from many of our neighbours. 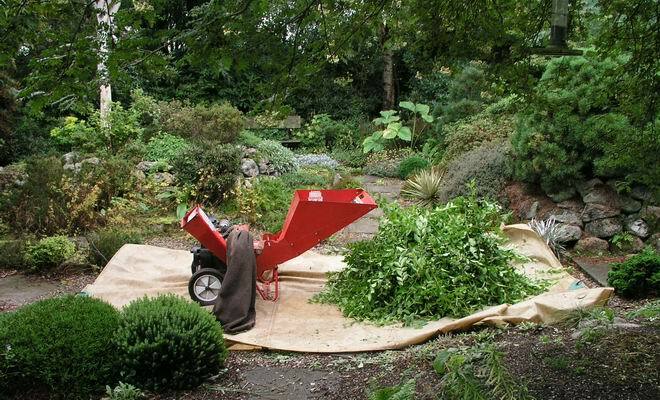 Along with our cement mixer, which mixes all our potting mixture, our shredder is the most important power tool in the garden. These hedge trimmings are very soft and leafy and after shredding they are built into a large heap to compost. Within twenty four hours the heap will reach a temperature of 70C and the material will be ready to spread as a mulch by late Autumn. After years of spreading similar composted material, parts of our garden have a very deep layer of humus-rich soil very suited to plants that enjoy 'woodland' conditions. 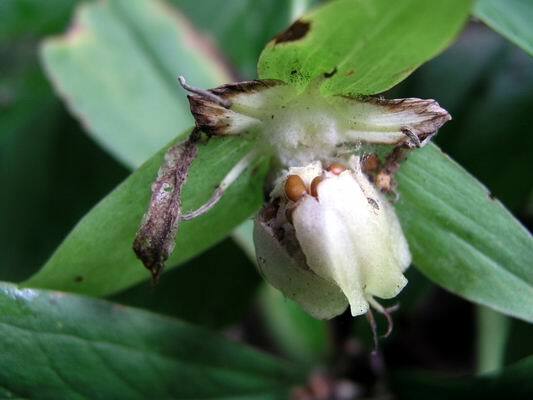 This seed capsule of Trillium grandiflorum is just splitting and breaking away from the stem. 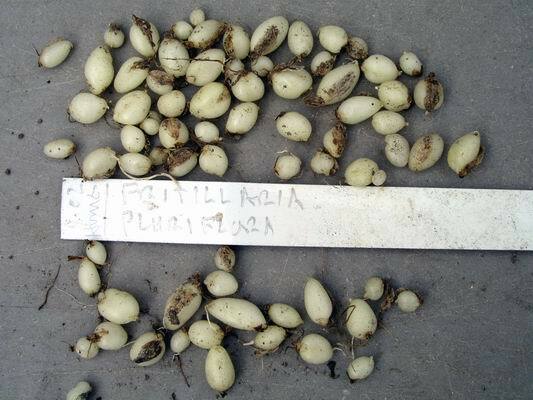 It is important, if you want to collect the seed, to catch them before they hit the ground. Check them each day and collect them just when you notice the first ones are splitting. 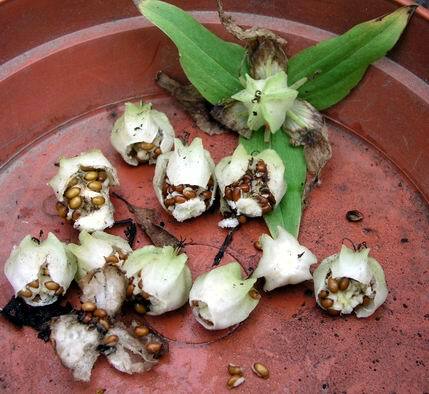 The wasps do not seem attracted to Trillium grandiflorum seed in the same way as they are to T. ovatum - I also notice that grandiflorum seeds are not so sticky and much easier to clean and separate than the T erectum I showed in the last log. You can collect the seed just before it starts to split and break away, like this one. 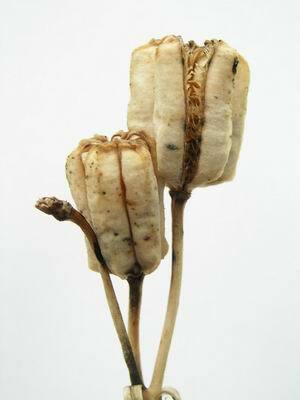 When you open the seed pod you will find that the seed is contained by a membrane in a neat wee parcel. All those people that cut off the dead flowers so that their bulbs do not 'waste energy' making seed do not know what they are missing out on. Apart from the hundreds of new plants they are missing, the seed pods are fascinating and beautiful. We can learn a lot about how we should sow the seed from looking at the seed pods and understanding how the seed is shed. 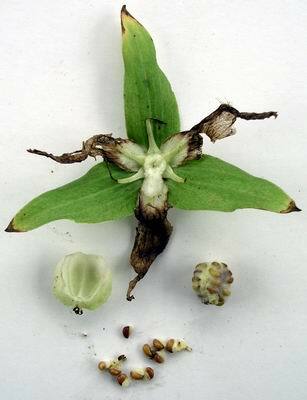 This Frit camschatensis seedpod is typical of all frits and is starting to split from the top. All down the split you can just make out small 'fingers' that hold the seed in position. The pod has evolved so that as the wind shakes the seed pods only the top seeds are shed, the others are held in place until the capsule splits some more, so the seeds are not all shed together but over a period of time - as the seed is wind dispersed it should be surface sown. Here are nice crop of Frit pluriflora seedlings sown in September 2002 and being repotted for the first time now, after two seasons' growth. 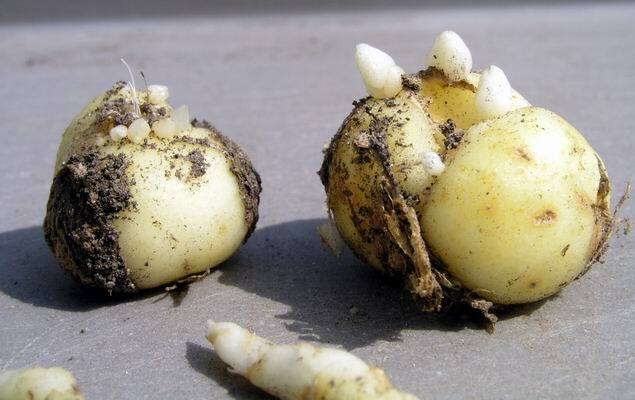 Leaving your bulb seeds for at least two years before repotting not only makes them bigger and easier to handle but it also takes advantage of the seeds that do not germinate until the second year, seen here as the smaller bulbils. Another interesting frit bulb (they are all interesting) showing offsets already starting to develop on the top are Frit Montana - these develop into short stolon-like bulbs in the first year before becoming normal bulb-shaped in their second year of growth. These Chinese Frit thunbergii bulbs are often multi-scaled making them distinct from the 'typical' twin scaled frit bulb and an interesting link to the lilies. Even though this Frit sewerzowii bulb has been kept in warm dry compost, the first roots are starting to emerge on the left hand side of the bulb. 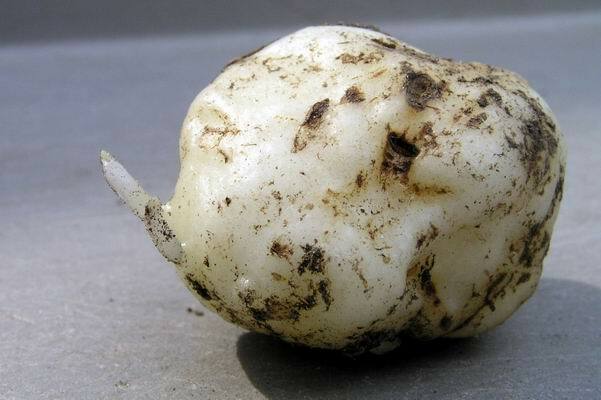 It is the bulb's built in 'time clock' that triggers this initial root growth, the presence of moisture will then trigger a period of rapid root growth. 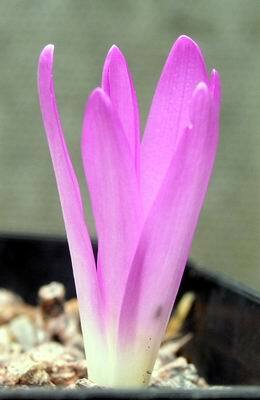 The first of the Colchicums to flower this year is C. montanum, formally known as Merendera montana, it is a tiny bulb with flowers of about 5cms which are among the first of the late summer/early autumn flowering bulbs. Finally one of the 'Asiatic hybrid' lilies that gives such a splash of colour in the summer. The splitting anthers reveal the beautiful rust orange pollen that leaves marks your clothes that are very difficult to remove. If you do get it on your clothes do not rub it; try lifting it off with selotape.